Happy Holidays: Behind the scenes, how I build trees and shrubs. Behind the scenes, how I build trees and shrubs. Well, that title makes me sound like a master tree builder, creating these things for years on end, or is that in my mind alone! The truth is that my wife and I love going for walks in the forest, the rural countryside, and by the ocean; we are so fortunate on the southern end of Vancouver Island that all of these areas are 5 to 20 minutes away from our home. I love looking at the plants and trees observing how the leaves and branches form as they grow as well as the landscape that they are growing in, so it is only natural that they pop up in the sculptures that I create. The picture above is a bundle of vintage Made in Japan flower stamens that have been wrapped in tissue. Thirty-five years ago I bought the entire lot of stamens from a craft shop that was going out of business, at 75 cents a bundle that was a deal. The batch of tissue wrapped stamens are then painted with a base coat of brown acrylic paint. I sort the stamens into piles of one, two, and three stamens. The piles of two and three stamens are then wrapped in tissue paper and left to dry. When they are dry they are then painted and left to dry. There is a lot of "Hurry up... and wait" during the creative process. Wire is then cut into six to eight inch lengths. Each small branch is made up of a group of one, two, and three stamens. The stems are painted, you can see at the bottom of the picture that I vary the placement of the one, two, or three stamen bundles. Five stems are then wrapped together to create a larger limb. Several limbs create a tree. I use the branches and limbs to create trees or shrubs of different sizes. Here are a few of the sculptures that have handmade branches and trees in them. 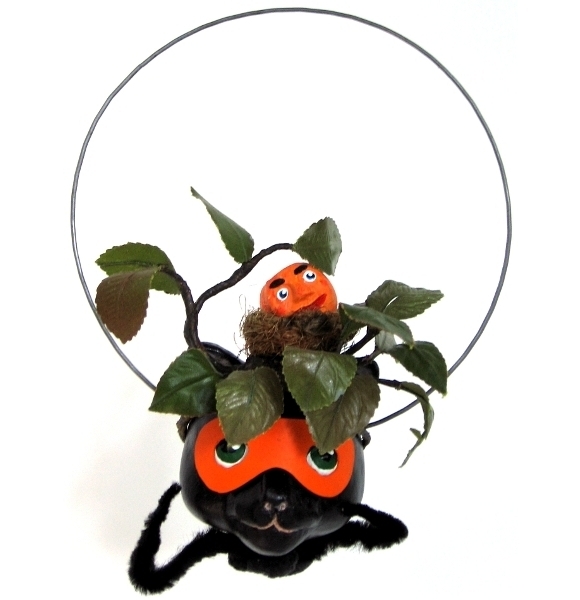 This decoration "Black Cat Came as a Bush" uses a crown made of leaves to create Black Cat's costume, a small bush with a pumpkin in a nest that is resting on his head. 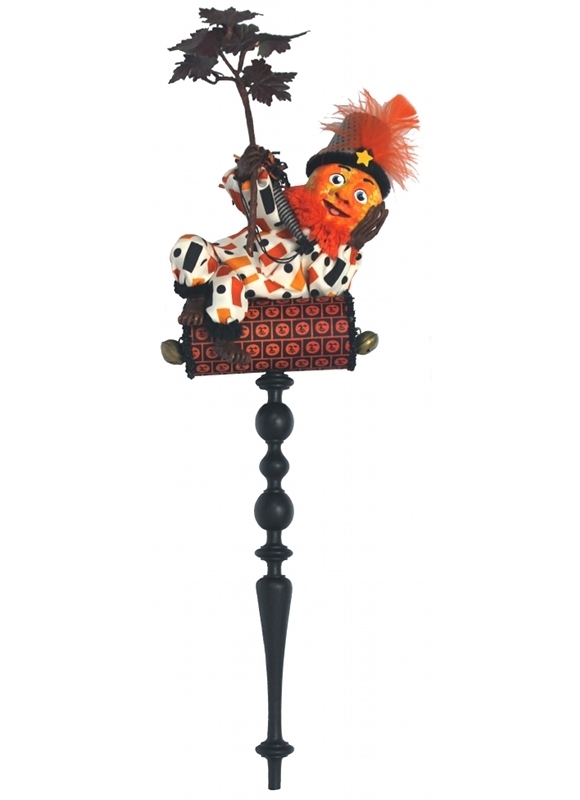 and this "Giant Portrait Rattle - Jack Came Dressed as an Autumn Jester". 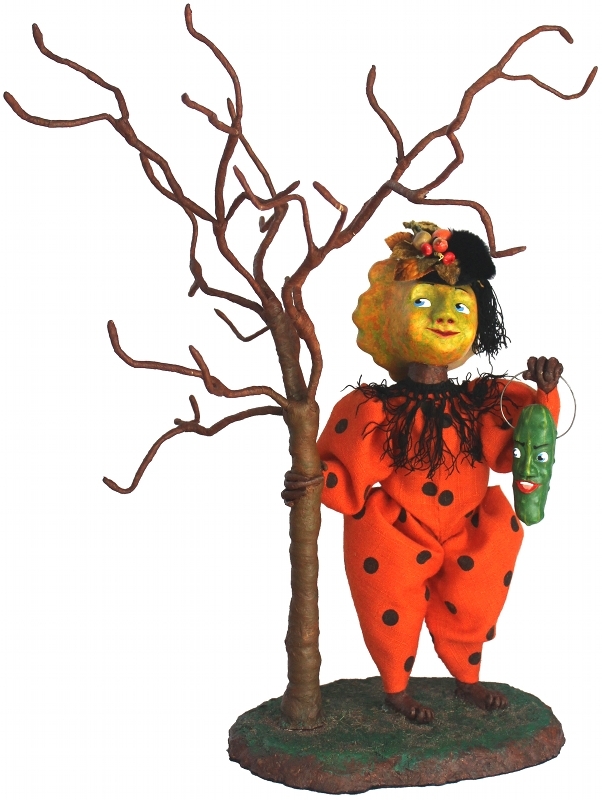 This was the first tree that I created for one of my sculptures, a candy container and table centrepiece, "Patty, Wayne, and the Party Tree". The 24" tree is meant to be decorated with your personal ornaments. This "Landscape Rattle - Ambrose and Monty His Parade Lantern" has my first very small tree, it stands 10 3/4" high, as part of the landscape. 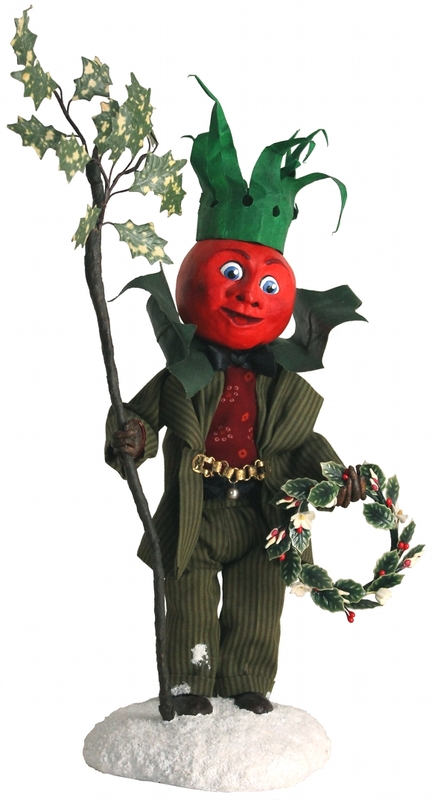 I have used three small trees as part of the undergrowth for this sculpture, “Landscape Rattle - William and Timothy and the Toffee Apple”. Bye for now, I must get into the studio and work. Very cool Len, thanks for sharing! The August EHAG Emporium is open!